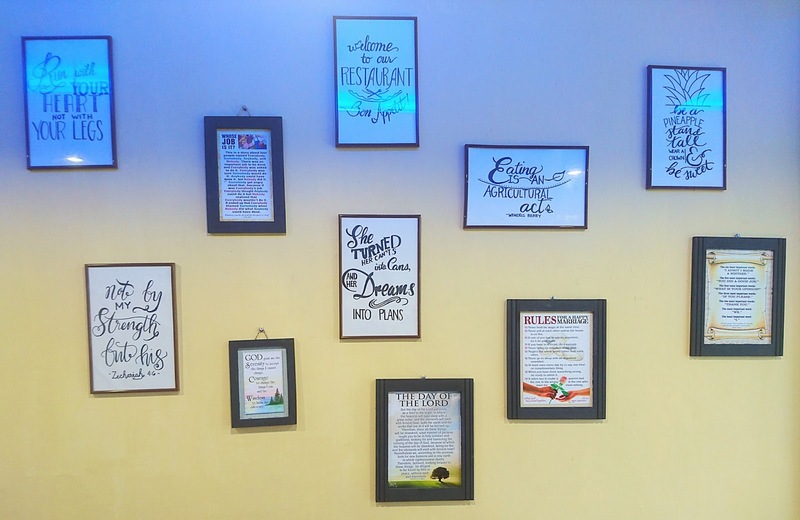 I missed the food venture here when my co blogger and kabatang.com admins visited this newly opened restaurant located at P. Zamora St. beside Bayad Center and near Reyes Haircutters. But it was also a right timing since the last time I visited this place which is Sub Grillin before, I didn't have the chance to dine in. So I immediately add it to my schedule to definitely try their Sisig. If you have been my constant follower or reader, you already know the fact that I am in search for the best Sisig and Carbonara in town. That's why my friends are also delighted to know how my hunting goes on and they really appreciate my input. So, upon entering the place for the 2nd time around, the ambiance is fresh, cool and well lighted. I also found out that they added musical instruments in the corner near the cashier area. Oh how I wish I could jam in there some other time, that is if you want to rain right after. Their logo actually reminds of my project when I was still studying at Cristo Rey, the "Spoon & Fork Resto". While waiting for my order, I also introduce myself (yes I didn't chicken out, I feel like the staff is really mabait kasi that's why I made friends with them agad) and they are glad that I still visited the place. Sayang nga kasi when they officially open the restaurant, it was actually birthday. How cool was that to celebrate my birthday next year at their Anniversary? Praying for their success, I already claim it! 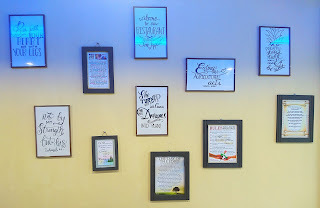 I also notice the number of framed motivational quotes and they even have the Marriage Rules similar to what my dear friend gifted me on my wedding day! So many significant things related to me in there, huh. I ordered the Sizzling Sisig Rice Meal for my early dinner and then I asked them if I can have the other one, which is the Lechon Kawali to be plated first before packing it for take out since I wanted to take a photo first for my blog. Glad they granted my request (uyy super plus points for that, accomodating na ang staff, nakaka request pa ang mangyan, hehe) and I just waited patiently for the meal to arrive. They also have the freedom wall and I was laughing at one posted there, so timely with the current trending crisis of Pinoys who loves to eat. Kaya daw aalisin na ang unli rice mga bes. Aha, finally! The last time I ate sisig was New Year's eve pa ata, it was Chicken Sisig pa ha. 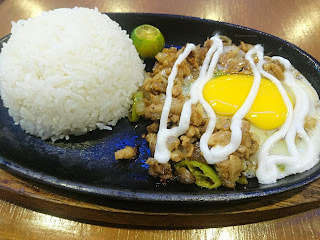 Mang Inasal was my favorite before but after limiting their serving and puro chicharon na lang, it was hard for me to find another resto that serves Sisig which is affordable at masarap. Aside from a stall at Nuciti (also my choice! Reminds me to make a review too) and Gerry's, I am adding up the Sizzling Sisig of Johannes Mel's. Thank God may malapit ng Sisig every after grocery time. What a stress reliever! The Sizzling Sisig is only Php99 inclusive of Iced Tea already. Nagustuhan ko ang timpla nila, both the sisig and tea. Super worth it ang price. Hindi sobrang alat, hindi din puro chicharon, at hindi siya sunog kung ikukumpara ko sa "SS" na kinainan ko, ayan I suddenly remember na it was February pala when I ordered Sizzling Sisig at SM at gaya ng ibang nagsarang Sisigan. Masarap ang Sisig nila, promise! Hindi din sobrang anghang but syempre kung gusto niyo ng maanghang, request kayo ng sili. Ako, toyo nirequest ko kasi gusto ko talaga yun sa sisig, parang ako, palaging may Toyo. 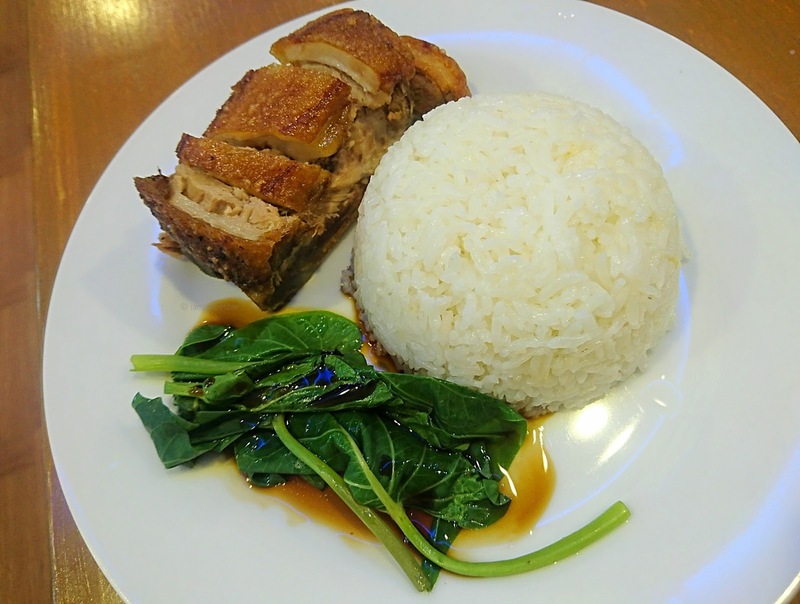 Do not ask me about the Lechon Kawali, my mom ate it though. But when I asked her how was it, she told me it was good. Of course the crispyness of it subsides already because I ordered it earlier tapos nag grocery pa ako after. So it was medyo makunat na when I got home. I'll just order it next time, promise to update you guys. Costs Php109 inclusive of iced tea but they just offered it to me since it can't be included for take out. I refused naman kasi that time di ko pa natitikaman yung saken, sayang, masarap pala at kulang ang 1 baso bes. I don't normally emptied my glass whenever I dine at food chains, malatak kasi. Sa Johannes Mel's, hindi! And because I wanted to try their other menu, I visited their place again last Thursday after my bank errands. 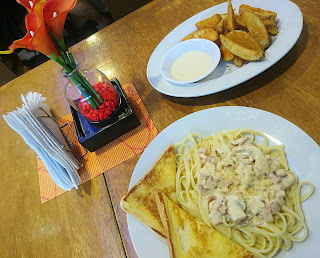 I tried their Carbonara naman plus the Potato Wedges. 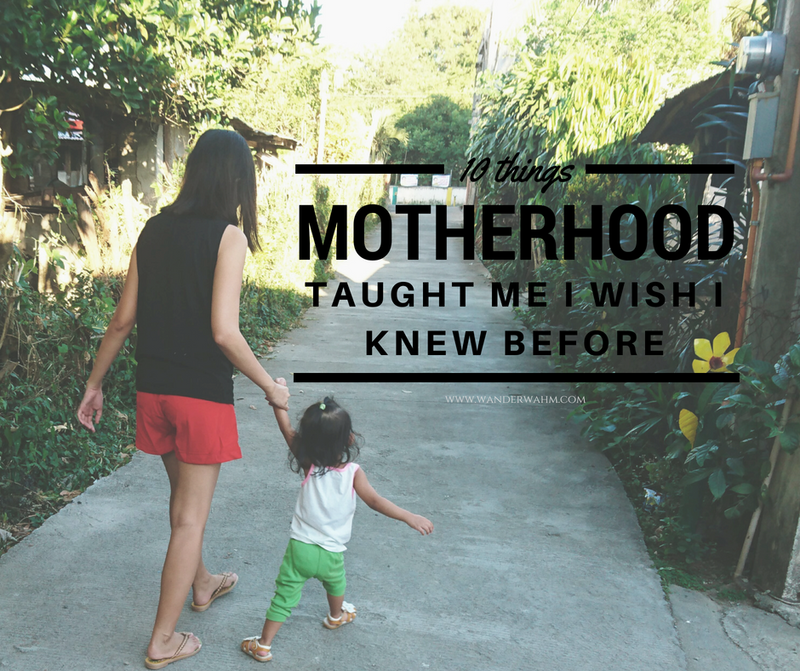 So many to choose from, sobrang babalik talaga ako dun lagi. The Carbonara is Php89 while the Potato Wedges is Php79. It doesn't include a drink so I ordered a glass of iced tea for Php20. Sobrang affordable ng meals nila diba? 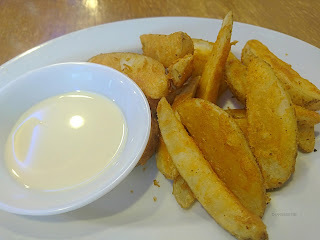 The Potato Wedges is not too salty, not bland either. Just right and also not oily (plus factor ito kasi ayaw na ayaw ko yung binabad sa mantika talaga) and alam mo kaagad na bagong luto siya. Soft inside a bit crispy outside. 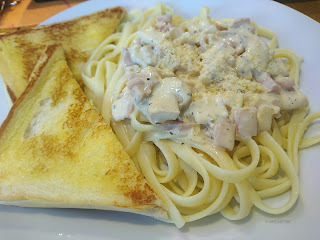 Di ko lang nagustuhan ang dip, malabnaw ang consistency niya parang yung sauce ng Carbonara. So I mix kechup with it, mas nice texture and lasa but not great combo either. I just experiment with it lang. Sana may ibang dip next time. That's for now. Sorry for the lenghty post, masarap kasi talaga. Btw, this is not a sponsored post. I paid for my meals and my input is solely based on what I experience. No echos, no eklavus whatsoever. Thanks for sharing your thoughts ate. I know now where can I bring boyfie next time. He is always eager to try stuffs with me, plus he's the photographer in some cases. Anyhow, it was funny cause I was also thinking of the SS in SM when you mentioned Sisig. I didn't posted about that cause I am not in the mood to mark my blog with complaints and so. Hihi, natabangan din po ako sa sisig nung SS. -_- hayst. I can see that the wedges' sauce was plain mayo? Am I right? 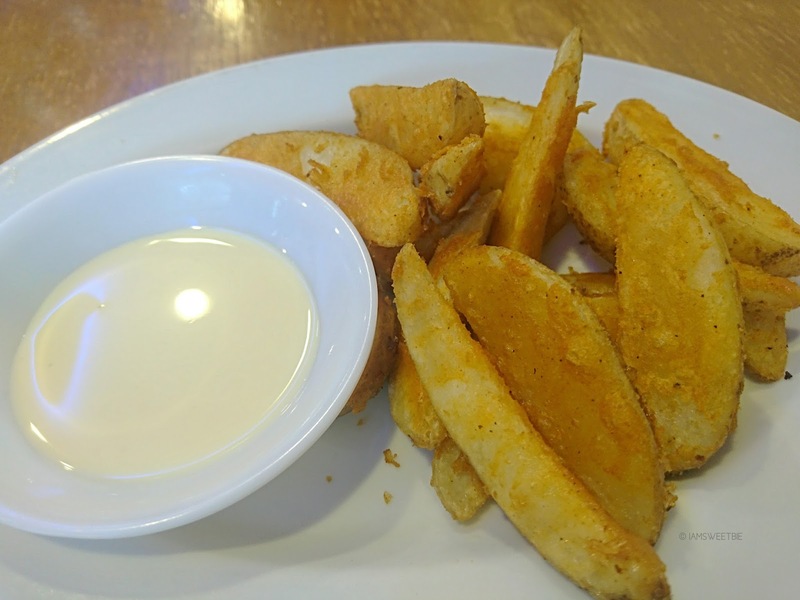 My standard leveled up when I had tartar sauce for potato. Medyo yun na po ang hinahanap hanap ko. hihi. Yung sa akin noon ay parang na overcooked 😥 About the Wedges dip, not sure if its mayo kasi yung consistency ng sauce niya e malabnaw talaga. 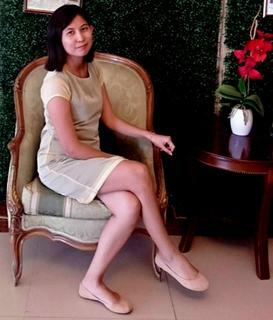 Parang di din siya lasang mayo eh.